I just can't get into my account.. gives an error ?! It says Application Error, what's that ?! Are there any problems with it now ?! Hi ferenzzz same here most likely an update to the site maybe getting ready for NIS2013? We're looking in to this issue right now. I will post back when this issue is resolved. This issue should be resolved now. Please let us know if you still have this issue. 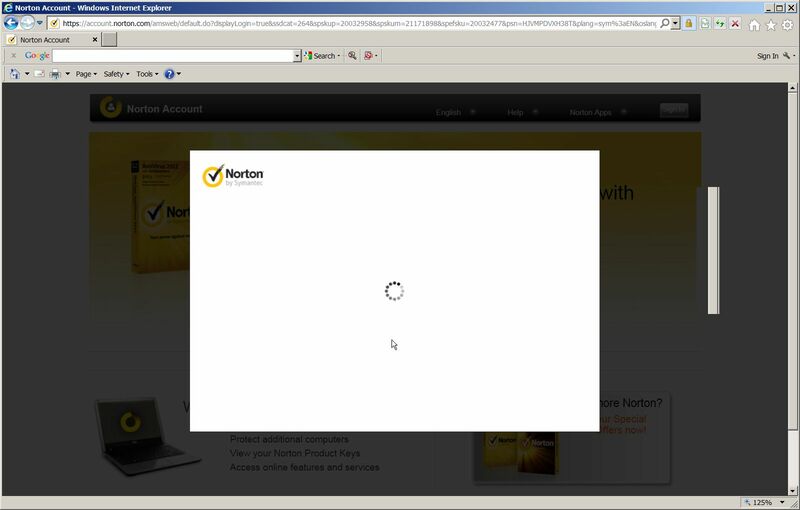 I can get into My Norton Account now - I could not earlier this afternoon. It's been running over a minute so far. Strange that it works for some but not for others. I just logged in from the NIS UI and I was able to login with no problem - 05/02/2012 6:58PM EDT. Still no connection on this machine so I rebooted into my XP system which has NIS 19.6.1.8 on it and before it updated I tried to log into MyNortonAccount from the NIS GUI -- no problem. I then ran LUD manually and restarted as instructed ... update to 19.7.0.9 --- still no problem with getting to MyNortonAccount from the GUI. I'm back in Windows 7 32 bit again and no change in what happens -- that screen comes up. XP will not have IE 8 as I have here in WIN 7. XP did ask if I wanted to show secure and unsecure stuff. It looks like this issue is intermittent for some, but not all. We're continuing to investigate this. My wife has been using the computer after dinner until just now and so when I came back to it it was on her desktop, her acccount. I opened NIS clicking on Account and logged in with the password and the Account came up in a flash. Now I'm back on my desktop and I just tried again and I can't get in via the Norton GUI -- same white screen. So -- something corrupted in my account that doesn't affect hers? I don't have a clue as to what to even begin to look at that might upset NIS so if there's something to investigate you will need to take me through it step by step. Just curious - did you log out of your wife's account prior to logging into your account? The reason I ask is I ran into something in regards to Non-admins Access to Settings with another user still logged in (also with admin rights) while working on a situation with Norton Security Suite (N360) - but can't rememeber what the exact problem was. A long shot perhaps, but if you log out of your wifes account and log into yours ( I assume you have admin rights in your account) then try to access My Norton Account via NIS UI. At least a starting point. Something weird is happening here, TIm. So I closed that down and Fast User Switched over to my wife's account as we always do; repeated the procedure which this time brought up a normal smaller centered log-in screen and it logged in OK to MyNortonAccount. So I Fast User switched back to my account, opened NIS and back to the white whirleygig screen.